I tried, I really tried to watch this train wreck. Then the lovebirds hosted the show in their pajamas (I swear they did) on Christmas a couple of years ago. And then, the wheels REALLY came off. Once their relationship came out of the closet, it was Katy, bar the door! I took it off my programming for a couple of years and then decided to give it another try. Bad judgment on my part. A note to Joe Scarborough: Joe! Please! Shut! Up! Stop pontificating, stop interrupting everyone, stop taking your viewers back to the 90's and your lackluster political career. Nobody cares and you had your own little scandal back in the day! I literally saw Jon Meacham grit his teeth when Bigmouth interrupted him for the umpteenth time. The dunderhead actually thinks he has more and better things to say than a wise, talented Pulitzer Prize winner. 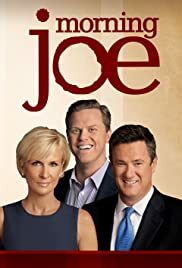 I tried, i really tried to give it another go, but Morning Joe has gone to the DVR graveyard, along with Hardball,where shows with self-satisfied, windbag moderators go to die.